As usual it looks like Abby brightens Gibbs' day on NCIS. "Better Angels" is the seventh episode of the show's 11th season. 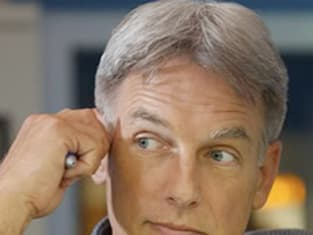 NCIS Season 11 Episode 7: "Better Angels"
Gibbs: Dad, German? That's the most important part. Jackson: No, son. The important thing was that we were both fliers. We were brothers up there. We were the same. We're all the same. But we keep fighting each other. Walter told me that he saved me that day because he wanted to remind himself who he was. He's dying, and all he can see is the people he killed, over ideas that weren't even his. He can't forgive himself. Gibbs: That's not an easy thing to do, Dad. Permalink: That's not an easy thing to do, Dad. Jackson: Walter, this is my son, Leroy. Jackson: Walter, nothing can make up for the lives we took. We both know that. But what you did was more than you know. You made my boy possible, Walter. And he helps people, Walter. He's a good man. He's the best person I know. NCIS Round Table: "Better Angels"